These are some of our thoughts about breeding. We want to make it clear to everybody reading this that they are our private thoughts and opinions not eternal truths. Some parts are scientific facts well proven, others are our own experiences formed through many years of breeding. We collected them here as an offer to those who have the patience to read through everything to get an idea about how we think as breeders and what we prioritize. We have learned a lot and also changed our opinion several times during all years and we see breeding as a dynamic process where you never stop learning new things. Therefore it can very well be that we in the future change our opinion about some of what we wrote here or get new ideas and change it along the way. We also want to make it very clear that we are not aiming to hurt any other specific breeders in this text. Some places we mention how we think other breeders do differently than us. These are general observations, not attacks on anyone in particular. We believe that people develop by daring to have an opinion. If you dare to have an opinion you don´t always think the same as everybody else and that is no problem to us as long as that is communicated in a professional way. All people do not have to agree with us for our sake, but we don´t have to agree either in what everybody else does. That we allow ourselves on our own page to express our opinion should not be interpreted as an attack on any other specific breeder as it is not at all meant like that. For us breeding is about a thought of the dog seen as a whole. It is about preserving the breeds we are working with in a humble way. Dogs are living creatures and as soon as genetics are involved in a project it becomes impossible to give any kind of warranty. To promise 100% healthy and happy dogs is impossible. This does not mean it is not what we strive for, namely that every puppy we breed should be healthy and happy and look as the breed it is. Breeders all have different goals and different ways to reach those goals. The thing about looking like the breed the dog is. Is it important? What if you never plan to set foot on a dogshow and don´t want to breed, all dogs are cute no matter how they look aren´t they? Well we think it is important. All dogbreeds are part of a cultural heritage. The breeds have all historically been part of different nations of people and have developed due to different tasks around the world. They have assisted people in hunting, herding, guarding, sledding and as companions. Climate, surroundings and worktasks have shaped the dogs in very different ways and that is why we today have as many different breeds as we do. One could have chosen to say who cares, we just breed and mix them all. Let´s see what comes out of it, we don´t need dogs for this or that specific task anymore so why keep that breed. Probably some of the puppies would be lovely, but many might not. Not all dogs are suited to be mixed together, a stressed herding breed mated to an aggressive guarddog may give puppies with serious mentality problems. Two breeds with each their hereditary illness mated together may produce puppies who will spread the illness even further and who will struggle with two problems instead of one etc. And as said each breed excisting today are all a cultural heritage kept and preserved by people around the world. It has therefore been chosen to keep breeding on a controlled level where each breed is preserved on it´s own, that is when we are talking about purebred dogs. No breed is recognized in five minutes. Normally there is a big historical work behind the approval of a breed. As much information about the origin and history of the breed as possible is collected, sources are studied and people who have or still are actively using or living with the breeds are interviewed and dogs are collected as foundation stock. It is a big work and it often takes years and from all the data collected the standard of the breed is written. For some breeds this work was done many years ago, for others it is more recent. In the standard the breeds origin and background is described as well as how the breed ideally should look and behave. Everything is described in detail, head, coat, angulations, the length of body, tail etc. The standard in our eyes is therefore any breeders bible and should be the first thing to learn by heart when you start breeding a breed. We breeders can not chose how a breed should be from our own personal liking. A standard leaves room for interpretations and often a difference in type can be seen from one breeder to another with dogs who are however all within the breedstandard. That is just positive in our eyes. That certain thing which it is so difficult to put a finger on which is a breeds type often is not easy to describe in words. It is the thing that really good breeders have an eye for. That all breeders don´t breed with the exact same eyes is just a plus for us as it preserves a diversity within the breeds. Dogs can easily be within the standards and have a correct breed type but still show a bit of variation. But if a standard asks for the breed to be light in body with square proportions then it is not up to a breeder to think they prefer heavy low dogs of rectangular shape. If the standard asks for a brave and active dog one can not chose that one prefers calm and a bit submissive dogs just as if the breed asks for a calm and unstressed dog one can not chose to breed on barking dogs with a high level of stress and activity just because one loves agility and wants dogs with a lot of speed. If the breed does not fit your desire in a dog one has to chose a breed which does, not alter the breed chosen! other people have a natural eye and instinctively see when a dog is well built and have a gift of knowing which dogs are a good match. There are other reasons than the ones mentioned here, but there is a big difference in the level of ambitions, the background and the goal of different breeders. Our goal with the breeds we work with is to always try to be true to their breedstandards. As said dogs are living creatues and genetic are difficult to fully control so nothing is ever completely perfect in dogbreeding and we think it would be spooky if it was. But it is important to us that the dogs we use for breeding live up to what is described as typical for their breed both when it comes to looks and temperament. That does not mean that each dog doesn´t have mistakes or that all breeding dogs should be champions, it means that they should posses what we feel is breedtype. We feel the entire idea of breeding purebred dogs is lost if this is not a goal. The security for a puppybuyer of a purebred dog should hopefully be the knowledge that they roughly know how this dog will turn out to be. They know the mental strengths and weaknesses the breed should have, they know which size it should become, how the coat will be and which care it will demand etc. If for instance you buy a breed and it should be a striping breed which did not need any specific coat care except stripping a few times of year then it would be stressful and irritating if you ended up with a dog with a much too soft coat needing weekly brushes and trimmings to keep it free of tangles and dirt. Same goes if you say have bad wrists and caouldn´t handle a heavy breed dog and therefore chose a breed who should at max weigh in at around 12 kilos as an adult but ended up getting one weighing 21 kilos making it difficult for you on a daily basis to handle the dog. If you know when buying your new dog that you have a huge desire for competing on a high level in agility and therefore chose a breed suitable for that, but end up with an individual who is lazy and unwilling to train that is also disappointing. Of course everybody loves their dog no matter how it turns out, but anyhow it is nice to be able to chose a breed from some specific traits and also be able to count on – roughly – that the puppy you buy will live up to this. And then we come back to the first. Is it important how a dog looks if you “just” want a pet dog? ”We don´t care about shows”, ”we just breed and sell petdogs so shows are not important” “ we don´t show because it´s not important to us, we care more about mentality” and a lot more statements are common to hear from both breeders and puppybuyers. Why is it that a petdog should not look like the breed it is and how can a breeder not care about shows? We don´t understand that. Nobody ever said that you can not breed dogs who at the same time look like their breedstandard asks for, but who are also healthy and have a nice temperament. There is no rule that beautiful dogs have to be sick and have character issues or that healthy dogs have to be ugly! Quite the contrary – a beautiful wellbuild dog with who moves freely and with ease and who has a correct coat will often also be a healthy dog. Many people who buy a purebred dog have absolutely no plans about showing or breeding but they anyhow fell in love with the looks and behaviour of a typical specimen of the breed so why should they not have as typical a puppy as possible even if they don´t plan to show? It is true that there is a very small number of breeds where breeding have altered their looks and health but that really is only a very few breeds and the big mainpart of the several hundred of different breeds do not have that problem at all. Dogshows in our eyes is the only way to get a judgement as a breeder of your breedingstock. Yes there is a difference between judges and some know more about your breed and others less and it is possible to get a judgement which is not accurate at all. So if you only ever take a dog to one show you might be lucky and get a good price on a bad dog or unlucky and get a bad price on a good dog. But if you show the same dog several times a line will appear where you get an indication of the dogs plusses and minuses compared to the other dogs in the breed. Whether you want to travel around the world trying to gain loads of titles or if you chose to just show your breedingdogs a couple of times at more local shows should be up to each breeder in our opinion. But to not show at all and not be interested in getting the breedingdogs and offspring judged we don´t understand. The standard of a breed as written above is not created in five minutes. It is a document created with a lot of research and knowledge. The biggest expert within a breed has put into words the ultimate ideal of the breed. It is not so in a standard that someone makes something up out of a personal interest. “We think big ears look cute so let´s write they should have that” or “the breed would look nicer with more coat, so let´s put it should have that”. The standard is written based on the historical background of the breed and everything mentioned in the standard has a function. The word function is for us extremely important. The Finnish lapphund and the Lapponian herder should have a coarse waterresistent coat all over the body because of their origin in cold and snow. A dog with a wrong coat or lack of coat would die in the cold at winter and be eaten alive by moskitos in the summer in Lappland. 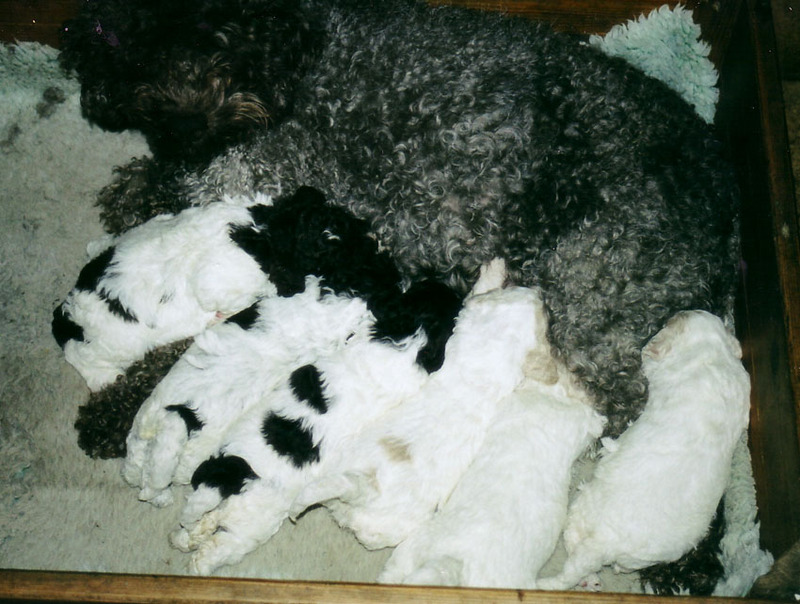 A lagotto has a curly waterdogcoat as it was originally a waterretriever who should swim and fetch the ducks and needed a functioning coat for this job. 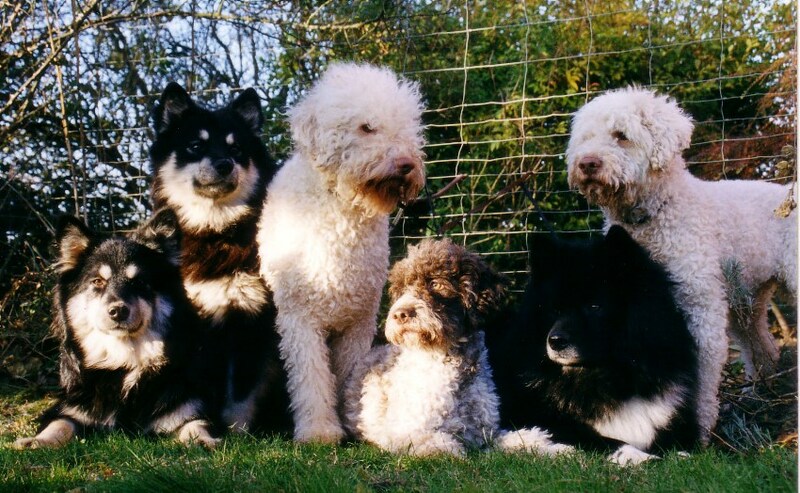 Of course the coat of the dogs are therefore judged at shows, obviously a lagotto with super nice curls and a typical coat will do better than one who lacks this just as a lapphund with a correct coarse abundant coat will often do better than one with a too short or soft coat. But this is not because of a snobbish idea about what looks the cutest. It is about the judges judging how close each individual comes to the standard of the breed and thereby also how well the dogs would be able to still tackle their original worktask, climate and environment. 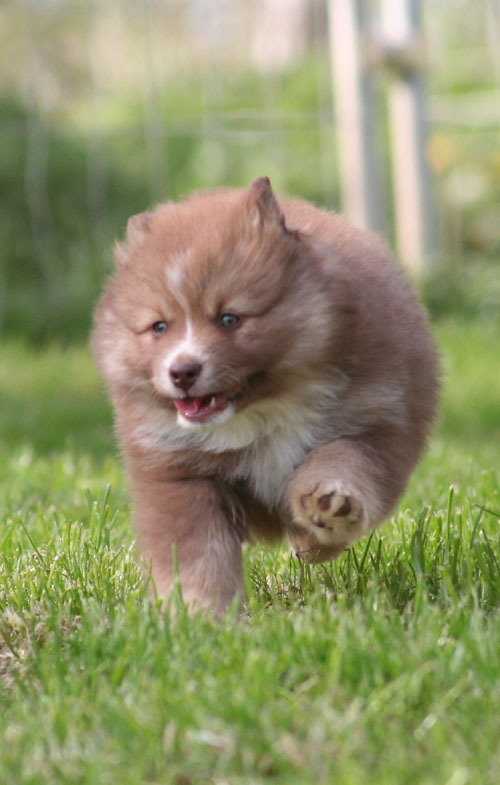 A lapphund with a poor croup and inefficient movements would struggle to run 50 kilometres a day in high snow on the fells and a big and heavy and clumsy lagotto would struggle to sit and keep it´s balance in a small boat and with ease jump out to fetch a duck and then jump back in. So to put it short, a dogshow is an assessment where the function of the dogs is evaluated. You don´t buy a Ferrari if your only plan with a car is to drive offroad in the forrest or a truck if you are a single person and only ever drive in the city and don´t need to pack a lot of things. Dogbreeds as cars and anything else which posses a function are created in different models and with different traits and those traits are what is judged at a show, not who has a pink bow in the hair as many might think if they never visited a dogshow before in their life. The keyword is function and if the dog lives up to the functions typical for that breed that is also what will give it breedtype and make it worthy to be bred. This is the security for a puppybuyer that possibly and hopefully progeny from that dog will also posses a lot of the desired functions for the breed. Everything is subjective and some judges are better than others, but the goal of a show is always to find the dogs closest to the standard of the breed they are. For us therefore shows are very important. Not just as a beloved hobby, but also because it is the place where we as breeders get our work judged and evaluated. All dogs with a pedigree are part of a breed and the possible genetic population. To state that you don´t care how typical or untypical the dogs are as they should only be sold as pets is therefore for us not at all valid. First of all as written above we think that those who buy a dog as a pet have just as big a right to get a dog who lives up to the breedstandard as those who buy a puppy intending to show. But secondly no breeder can know which of the puppies sold will end up being used for breeding. A dog sold as a pet can later change owner or the family can grow a desire to show and/or breed even if they did not plan it from the beginning. All dogs with a pedigree are a part of the breed and possible breedingdogs and the more of them who are typical and keep the breedtype the better and the more good dogs there will be to chose from when breeding. If 65% of all puppies registred in a breed are of so poor quality that they are actually not worth using for breeding then 65% of the breed is genetically lost. Why breed purebred dogs if the goal is not to maintain the breed you work with? The less genetic variation in a breed the bigger risk for diseases and inbreeding. In our eyes it is much better if the breed keeps such a high level that it is possible to go out and use “ordinary” dogs for breeding so that as many different dogs as possible are used instead of that it is just a few stars who gets loads of litters. But this can only be done if the ordinary dogs have a quality worthy of breeding from them. To not strive to get it as good as possible in every single litter registred in a breed is therefore in our eyes wrong. No dog is perfect and as said before, genetics can not be fully controlled. We are not working with maschines and we all get surprises along the way or dogs come out differently than expected. It will always be like that. But our starting point and goal is always to try to get as many typical dogs in each litter as possible; dogs who with pride can be happy and healthy pets but who also with ease any day can enter a dogshow and get a good judgement as typical for their breed and dogs who if necessary, even if not sold as breedingdogs or showstars with advantage can be used for breeding and if so can add something positive to the breed. Genetic diversity is important. When negative things are sometimes heard about purebred dogs lack of genetic diversity (or ignorance about what purebred dogs actually are) is often to blame. Breeding where a single dog or line is overused or where a lot of inbreeding is done can cause a lot of health issues in dogs. It can be tempting for a breeder if a single dog or a family of dogs really throw what you desire to use it too much. Specially some decades ago it was not at all uncommon that a single male could sire a huge part of several generations of dogs because he produced very well. This kind of breeding creates several problems. First of all a single dogs genes are spread too widely. All dogs carry some kind of defects, one or the other, normally several. Some are of a more serious nature, others are quite harmless. Many of these defects don´t really show until late several years after a dog was used for breeding. If a single dog has already had hundreds of puppies before he himself is diagnosed with a disease or he is closely linked to one it is a lot of dogs which are affected negatively. Besides from that another problem is created namely regarding breeding in the next generations. It is not uncommon if a single dog has been overused in a breed that almost all dogs in a generation are related to each other and have that some dog somewhere in their pedigree. That can make it really complicated to find a partner to your dog which is not related. Each time you chose a dog for breeding you chose not to use another dog. If one single dog is used for 45 matings in a breed instead of for instance 5 it is 40 times another dog has not been chosen! Those 40 other matings could have contributed with other genes and other traits to the breed and in that way genetic diversity is lost. For a breed it is much better if many different good dogs are used for fewer matings instead of that few dogs are used for a lot of matings. There are a lot of different ways diseases are inherited but some of them demand that both the mother and father of a puppy carries the gene for the disease in order for a puppy to get sick. The closer the relation between the parents and the smaller the genetic diversity among the breedingstock the bigger risk there therefore is that both parents would carry the same gene and produce sick puppies. Long before studies were done in genetics the people who created the breeds we have today actually by common sense understood a lot of this. First of all their breedingprograms were often tough, only the fittest could be allowed to survive as they used the dog as a tool. The healthiest, strongest and most clever individuals were the ones they wanted to use for breeding simply because the dogs often played a crucial part for them in their work. But often they also put a bigger work in “breeding” than many today may think. The Saami for instance would write pedigrees several hundred years ago and could travel far to mate to the right dog. Many think that a more primitive lifestyle would do that dogs were just allowed to mate and inbreed as they pleased, but most commonly this was not the case. Most nations of people have tried to prevent inbreeding and they have controlled which dogs were allowed to reproduce and which weren´t based on the qualities they desired from the puppies. Experience had shown them that the strongest and most healthy puppies were produced by preventing heavy inbreeding and if they introduced new bloodlines to their stock every now and then. It is exactly the same we breeders who work with the breeds today have to think about and therefore we need to think in pedigrees, different lines and to keep different bloodlines alive in the breds and for us as breeders it has therefore always been important to widen our genepool. In the breeds we work with we have tried to use as many different lines as possible and we see it as a plus that we have several times also used lines not used by many other breeders. For us when breeding everything is a question of waying for and against. We too have dogs in our breedingprogram with dogs in their pedigree which are commonly found on many others pedigrees as well. Sometimes it is like that, you can not dump all good dogs just because they have a common dog in the pedigree here and there. Everything has to fit. But we have pedigrees too with very different dogs than the ones many other breeders have and for us as breeders it has always been important to look at the dog and its breedtype, its health and its mentality but also on its pedigree and its lines. We have chosen not to mate with several outstanding dogs for the single reason that we felt they were already overused and there were too many dogs already with that genetic line. For the same reason we never repeat a combination either. If we mated two dogs once and got a litter from it we see no reason to repeat it. If problems should later occur in that litter it is better to only have 5 dogs with that set of parents than 25. There is no use for that many dogs with completely identical genes either and we personally just can´t see the thrill or excitement in repeating something we already did once. When mating two dogs we always try to think about the future of the breed. It is not enough on a short term to think a combination will produce nice puppies one also has to think several generations ahead and consider if this pedigree will be useful and might use some valuable lines and preserve some dogs in the pedigrees who might otherwise have died out. One have to think if the puppies from this litter will be some who will be difficult to use for breeding in the future as they will be related to all other dogs in the breed or if they might actually contribute with something a bit new. For that reason during the years we also imported a lot of dogs and travelled all over the world when mating. Different bloodlines and always making a combination we believe in is important to us as breeders. And then we come to this big question of health. As previously mentioned purebred dogs have often (wrongly) been labelled as sick because of inbreeding and other problems. There are as mentioned a very small number of breeds where this sadly is the truth. Where a breed has been altered to such an extreme degree that the dogs get difficulty breathing, moving etc. But those breeds really are the exception. If you look at all the recognised breeds it is a very small number where this is a reality. It is however a very efficient scaring campaign creating a wonderful argument for breeding as untypical dogs as possible because “we care about health not just looks”. In that spirit health is often mentioned. Many advertise that that to them health is the number one priority and that makes a lot of sense to people about to buy a new friend they should hopefully live with the next many years. Who cares if the dog has a tad big ears or a short coat as long as it is healthy and happy! I think we all would think like that. Hopefully everybody who ever plan to breed a litter of puppies have it as a goal that all the puppies should be healthy and be able to live long happy lives with their new family. But the question of health is often more complex than one might think at first and a warranty is impossible to give. When we started over twenty years ago the only real check up done was an eyetest before breeding. Slowly it became more and more common to also hiptest the dogs and during the years more and more diseases were found and new possible tests were developed. Patella, elbows, a lot of autoimmune issues like epilepsy, allergies and addisson and several others and a growing number of DNA tests which can reveal if the dog carries genes for different kinds of mutations. The more we know and the more it is possible to test for the more it becomes a science to be a dogbreeder and understand everything about genetics. For many – breeders as well as puppybuyers – it becomes overwhelming and it becomes difficult to see through what is actually dangerous and necessary and what is not. The many possible tests can sometimes scare people into believing that all dogs in a breed suffer from the problem it is possible to test for even if that is very far from the case. Our motto is always to try to think in a whole and to only use healthy dogs for breeding. But for us a healthy dog can have a microscopic spot in one eye with an eye specialist says the small spot will never affect the dog or its vision and most likely won´t even be hereditary. A healthy breed can also for instance have a C hip if it’s a breed who doesn´t struggle with bad hips and may be build in a way making it difficult to get a fair result given the system used for judging the hips. A lapphund for instance can have excellent hips but a bit lose joints and still get the result C. A healthy dog for us can also easily be carrier of a recessive mutation. It means the dog itself is healthy but carries a gene which if mated to another carrier can produce a sick dog. But if that is avoided and the dog is mated to one who is tested and clear the problem is solved. We therefore see a huge difference between a healthy well functioning dog and a diagnosis on the paper. We have seen many examples on excellent and healthy long lived dogs who could have brought loads of positive things to their breed but who were not used for breeding due to some minor insignificant result in a test which never affected the dog all it´s life or due to the fact that a sibling or cousin got sick and people were then scared to use the dog even if it was perfectly healthy itself. Is it to breed healthy dogs to exclude these kind of dogs from breeding? Not in our eyes. The fear of breeding a sick puppy scares many and one would so love to be able to guaranty that the puppies we sell would never struggle with any kind of problems. One really wants to believe that if tests have been made for this and that and the parents came out healthy then all the puppies will be healthy as well. Sadly that is just not the way we are and therefore we will never be the type of breeder who states that we only use dogs with A and B hips for breeding or never use a carrier of some mutation etc simply because it is to install a false sense of security in puppybuyers. There is no warranty – sadly. Dogs are living creatues and just as people they can get sick. We can test and test until we turn green in our heads but it won´t change the fact that there will still be new diseases we did not find tests for yet or new mutations will happen and new diseases appear. That of course does not mean that we should not care! As a serious breeder today you are forced to learn as much as possible about genetics and inheritance and to try and learn as much as possible about the diseases which are problems in the breeds we are working with. We always try to avoid breeding sick dogs and results of diseases should always be taken seriously. But the important thing for us is as said a whole. The more things it is possible to test for the more impossible it gets to find dogs who are free from everything and then it starts to be up to the breeder to decide what is important and what is not. And our personal evaluation is that we will rather mate with a dog who has a tiny spot in one eye if that dog contributes with a lot of other positive traits and is fit and healthy instead of a dog who may be tested clear for everything one can test for but threw several puppies with epilepsy. Dogbreeding unfortunately is not black and white. DNA tests is a fantastic tool if there is a serious disease in a breed one needs to avoid. But the bigger the market becomes the more tests become available with no actual relevance. It is a huge market for the companies selling the expensive tests and as a breeder one has to think carefully if a disease one is testing for is actually a problem within the breed. One also has to understand how the disease is inherited and how the situation of that disease looks in the breed to know if a carrier is a problem or not and to know how important it is that a puppy comes from tested parents or not. As a puppybuyer it can be a very false sense of security to get a puppy from two parents advertised as tested clear of some disease which is not at all a problem in that breed! Breeding for us therefore as said becomes one big whole. All dogs carry some defects, if they are free of the diseases you tested for they carry something else you did not find yet. We use common sense combined with knowledge. We read so much about genetics and learnt about many different diseases and how they are inherited. That knowledge we use combined with our common sense. If several dogs closely related to eachother struggle with the same problem or if a dog itself has been sick then of course it should not be used for breeding. But a dog is never just hips, just eyes or just the result of a single dna test. The genetig diversity, the mentality and the type as well as everything else is important too. It is important to understand that no dog is perfect and what looks perfect on the surface hides something else underneath. The important to us if there is some kind of comment on a dogs test result it is what the comment is and how it possibly affects the dog and how it might affect possible offspring from that dog. And in that respect very little is black or white and we believe breeders have to dare to take the responsibility of which dogs can be used for breeding and which cant. It is easy to hide behind statements of only using dogs tested clear of this or that but as said for us nothing is as black or white as that and there is absolutely no guaranty that you won´t have puppies suffering from one problem or another from such a combination anyway. Therefore: we always do our best to breed as healthy dogs as possible, we take that as a sure thing and so far luckily during the years we succeeded. But we are not hysterical when it comes to test results and we will never advertise that our dogs are free of a lot of things believing that that will make all puppies bred by us free as well because the truth does not look like that in our eyes.